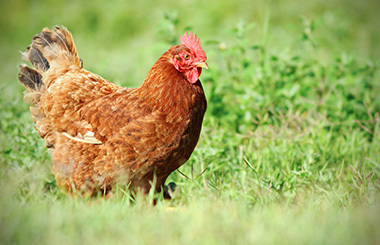 - The company is keen to participate in all the special scientific and technical conferences related to breeding poultry and it hires specialized consulting offices to follow up the latest studies and research on the work. - The company sends techniians and supervisors to have special development courses in Italy so as to raise the efficiency and capabilities of its employees. 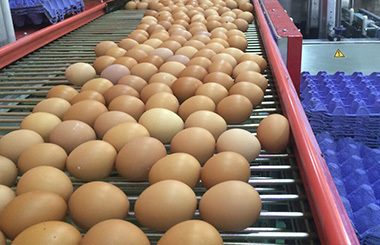 - The company shall establish a project in Muthanna Governorate, Samawah city for the production of eggs with a capacity of 1.600.000 egg-producing chickens. Total capacity of the company: about 1800 to 2,000 boxes per day, which are supplied, to some southern central provinces as well as Baghdad. 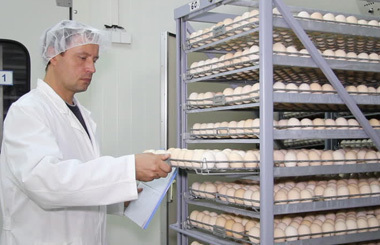 Egg box capacity: 12 rows each of which contains 30 eggs, i.e. the box contains 360 eggs. There are plastic rows containing 15 eggs for each. Egg color produced in ALYAQDHAN Company: red only. Egg weight: about 70 g.
Egg is a nutrition source as it contains a high nutritional value and is used in many food products, pastries, etc.